By the 1970�s, the once thriving Anthracite roads were struggling to survive. These railroads managed to keep the freight rolling into the mid 70�s with little resources available, but the die was cast and all the Anthracite roads would eventually be swept into Conrail in 1976. 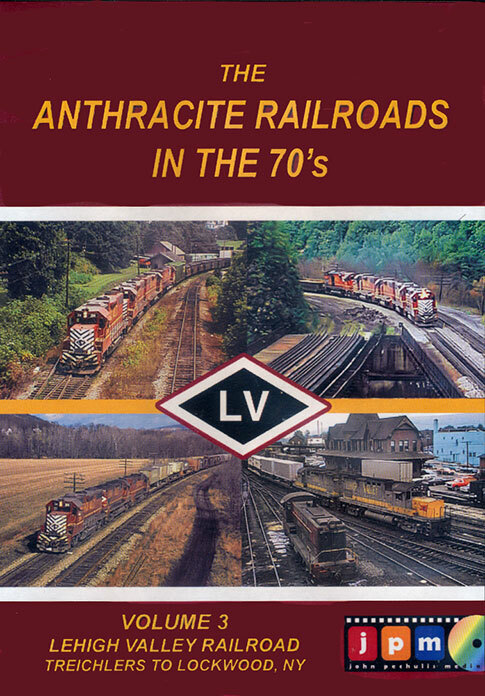 In Volume 3 of the Anthracite Railroads in the 70�s series, we�ll continue our look at the ailing operations of the Lehigh Valley Railroad from Treichlers, Pennsylvania to Lockwood, New York in the last few years leading up to Conrail. TRAINMASTER (HENDERSONVILLE NC US) on 2016-07-29 08:50:59. Wow! Another in the continuing (I hope), Mike Bednar LV saga. As I have come to expect Mike's commentary is priceless, just when I thought he was mellowing...NOT! In viewing this latest volume, it is again apparent that Mike was and always will be an LV railroader, he loved his railroad and its' people. That sets this series apart from others. Video is excellent as is the audio-JPM really does a fine job with this aging material. Recommended....absolutely! Patrick W. (Millville NJ US) on 2016-09-04 13:22:34. This is a terrific video for fans of the Lehigh Valley. For its age the quality of the footage is fantastic and the content is awesome as well. Narrator Mike Bednar adds some great personal insight as well as his professional insight being a former Valley man. I highly recommend this to anyone who is a fan of 70s railroading in the northeast.